Although it's now a bit behind the curve of modernity-what with its pixelated monitor images celebrating strikes ("Bowlin' 'Em Over!") and spares ("Roooom 2 Spare! 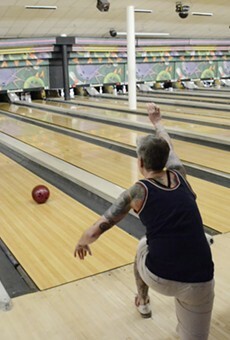 ")-the Lucky Strike is the bowling equivalent of what Goldilocks seeks in porridge: just rightness. Having been to so-called "cutting-edge" bowling alleys, we prefer the appropriately tacky ambience of the LS-you want some "tack" at the lanes. It's easy to imagine yourself as one of the cinema's bowling elite there: Walter Sobchak, Ernie McCracken or maybe Fred Flintstone. 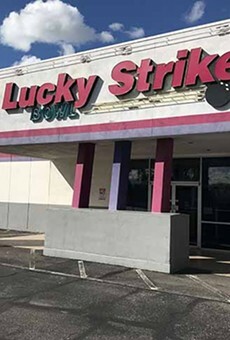 To boot, the Strike has 99-cent Mondays, Cyber Bowl (technophobes, fear not-"cyber" merely means "distracting") and a reasonably priced savory snack counter. Oh, yes, and golden, delicious beer.